Not a green and yellow basket, as the children’s nursery rhyme would have it, but a green and purple American basketflower (Centaurea americana). Sometimes standing as much as five or six feet tall, it spreads along ditches in great colonies, appears as a single plant at the edge of parking lots, or scatters across fields. Its color varies from pink, to purple, to creamy white, but always there is the “basket” — the stiff, straw-colored bracts just beneath the flower head that look for all the world like a woven basket and provide its common name. After weeks of fearing one of my favorite flowers would be in short supply in our area, it suddenly swept across the landscape in great waves. From every angle, at every stage, it’s a delight to photograph, with or without the insects that seem to enjoy it as much as I do. A delight to photograph indeed! And you do it so well. The details are marvelous (gotta love that camera crispness and your steady hand!). I can imagine what those are like, sweeping across the field. A little bit of heaven! I think I may have seen these for a couple of years before realizing their true identity. They look remarkably like a thistle, and at a distance, “tall and purple” can be misinterpreted. Once I realized they aren’t the same, and began to look for them, there they were. This year they’re everywhere, and still blooming. There will be more photos, believe me. It’s been heavenly to have so many around. that the European flower has occasionally appeared in paintings. That made me wonder if our basket-flower has also been the subject of, or at least appeared in, any paintings. I searched a little but didn’t find any instances. Oh well, the basket-flower has certainly been the star of many a photograph, including the three you’ve exhibited here. My grandmother’s flower garden is becoming more interesting by the day. She not only grew zinnias, she had a long, narrow bed of bachelor buttons along a sidewalk. Thanks to the article you linked, I now know those bachelor buttons are cornflowers, and related to our basketflowers. I read that the cornflower plays a role in Swedish culture, too. Now, I wonder if she grew them because they reminded her of the home she left. Something I found strange is that Centaurea americana doesn’t show up on the BONAP page. I looked for synonyms, but none of the four I found showed up, either. Curious. What I did find was a great photo of dried basketflowers accompanying an article titled “Fried and Joy.” I knew as soon as I saw the thumbnail who that belonged to. And in Schinners and Mahler’s, I found my next little project: “The stamens are reported to be sensitive to touch; when touched by insects, they suddenly contract and push pollen out onto the pollinator.” I’m going to go make like a bee, and see what happens. The article’s author, Amy McCullough, was coincidentally one of two people from the Wildflower Center I had lunch with yesterday. I hadn’t met her till then, though we’d exchanged e-mails. I can’t explain why BONAP didn’t include Centaurea americana. Let’s hope you have good results making like a bee. Very cool shots! 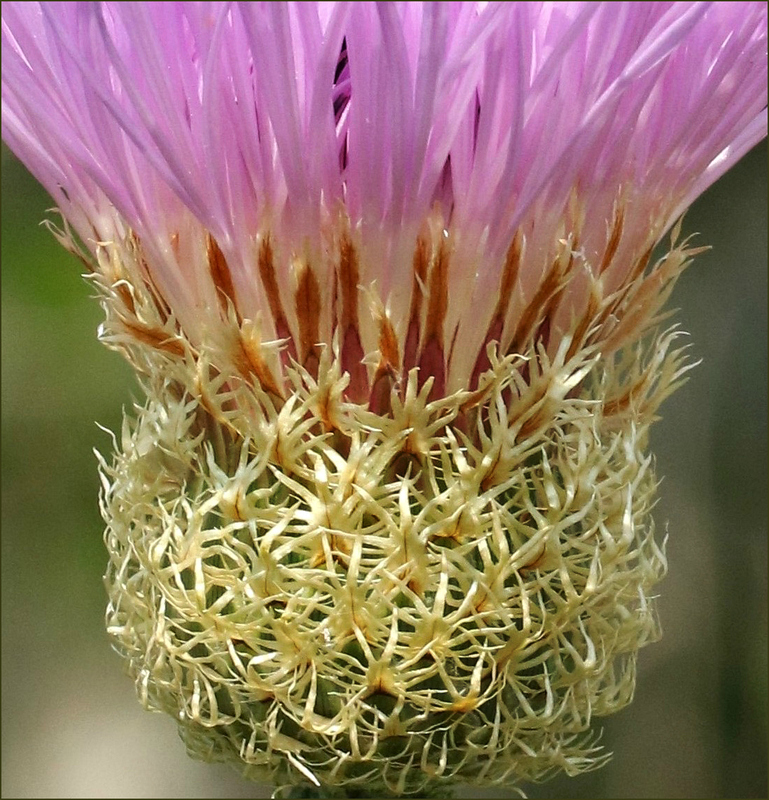 We have thistles with similar flowers, but they don’t have this cool basketry thing going on – excellent closeups. I don’t know anything about wildflowers, and had to look up “bract,” I thought that’s what Bill the Cat used to say in Bloom County, but it turns out to be “ack” or “thbbft!” instead. Then I remembered that every spring, when we admire the wild dogwoods, those are bracts, also. Five or six feet tall?! neat. It’s the basketry thing that helps distinguish this flower from thistles, and from other pinky-purple flowers that sometimes get lumped in. We have similar thistles, and I’m sure I’ve confused the two species in the past. “Tall and purple” may be a thistle, but then again, it could be not-thistle. I loved Bill the Cat, and Bloom County generally. I never figured out if Steve Dallas was supposed to be a fictional Hunter S. Thompson, but he surely did look like him. “Bract!” would make a pretty good expression, but the flower parts are neat, too. Poinsettias have them, of course, and some euphorbias, like our snow-on-the-mountain and snow-on-the-prairie. I never would have thought about dogwoods, because they aren’t common here. I think the only time I’ve seen them is in Mississippi. The photo at the top shows some of the tallest basketflowers I’ve seen. There’s quite a colony of them at the base of a billboard support structure down the road from me. For a variety of reasons, they never get mowed, and every year they seem a little taller. I’m sure some of them were even more than six feet tall this year, but three-to-five feet is more common. That snow-on-the-prairie is also interesting. A couple of years ago, a thistle plant was growing in the garden while we were away, maybe a Scotch thistle, and I decided to water & fertilize it. It ended up like a six foot Christmas tree, covered in purple blooms, a couple of neighbors actually came over to see where they could get one, until they got a good look at the spines. “Bract!” is good to know. Dogwoods are one of the best things about spring in the Northeast – – you’ll be going through the woods and see these beautiful, delicate-looking trees, and it seems kind of magical, they don’t look like something that would survive our harsh winters. 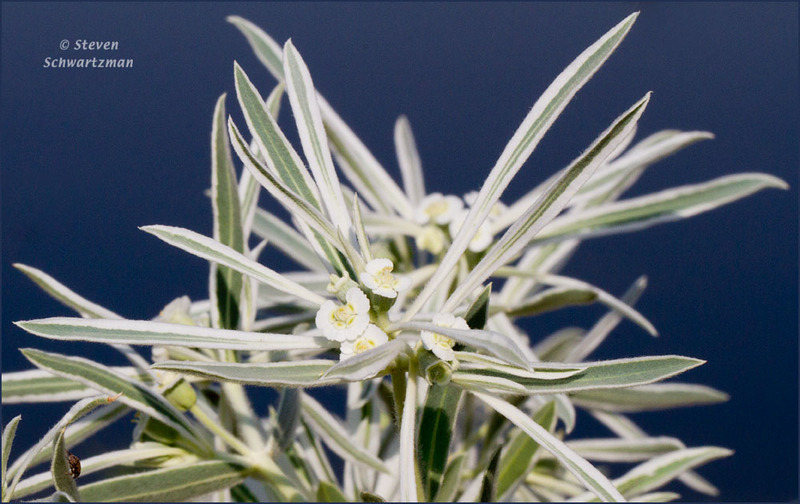 Euphorbia is also a new word to enjoy. A good name for a cat, I think, one with an upbeat disposition. Hunter S. Thompson was definitely Uncle Duke in Doonesbury. Steve Dallas was more like some of the frat guys at my college in Maryland, but I don’t know Bloom County as well, I’m a fanatic Calvin & Hobbes guy. With your favorite flower, you certainly did justice to its beauty! I learned just this week that they’re easily dried, and hold their color. The instructions couldn’t be easier: pick the flowers right after the dew dries, bundle them up, and hang them upside down for a couple of weeks in a cool, dark place. I’m going to see if I can find some nice ones still blooming, and give it a try. A friend dried some zinnias that way, and it worked beautifully. I have a couple more photos that just tickle me to death. Finding new ways to look at flowers always is a great deal of fun — as you surely know from your garden. We have purple thistles in the everglades which have some similar basket like parts just not as much. I too find them interesting to photograph texture wise. Sometimes you get absorbed in the plant and later realize how grungy with spider webs it was. But, there are always times when you get a nice clean one. Spider webs are ok a) if clean b) if they have water droplets…otherwise…ick!! Your images here have lovely color and texture and I like that top composition against the blue sky. I remember that you’re not too fond of the spiders, or their webs. I’ve seen a lot of strands of silk on the basket-flowers, but not many spiders or complicated webs. There are plenty of hoverflies, bees, leaf-footed bugs, and ants, though. I haven’t seen any butterflies around them this year, although two years ago, in a different location, there were swallowtails and sulfurs galore on the blooms. I like the blue sky as a background, too. It’s nice and clean, and shows off the complicated bloom. I am totally blown away by this one. I had never heard of it. The woven “basket” is amazing and your close-up photography is amazing. It must be a lovely sight covering a large area. It is fun to see great stands of them, but it can be hard to get a decent photo of a single flower where they’re so thick. I was lucky this year to find a place where they had spread a bit, and were growing in places I’d never expected to find them — especially around trees. That seemed strange, until I read that they’ll take partial shade. On the other hand, I’ve found them growing down the coast, along the shore of the bay, and on gravel and sand banks with cactus. I don’t think they’re too fussy! They’re beginning to fade now, and they’re just as interesting when dry. I have other photos to share, including one or two that I think will please your artist’s eye. Nature is the finest artist! Lovely. Thank you, GP. Just today, I read an article about “paintings” done by robots, and there was great excitement about this new form of art. Well, perhaps. But I’ll stick with what nature provides — and the ways that human artists portray nature. There’s enough beauty there to keep me happy. I’ll be interested to see what you find. I read that these basketflowers dry quite nicely after being cut and hung upside down for two weeks or so. Apparently they don’t lose their color, either. I’m going to get out on the first dry day we have — maybe tomorrow — and see if I can find some to experiment with. The knowledgeable ones say it’s important to wait until the dew dries from them before cutting. As much rain as we’ve had, it’s not the dew I’m worried about. Is the rain a result of the tropical weather that was west of Mexico? I’ve not seen a weather map this week…. I hope the weekend gives you great weather for exploring! It may be, but it’s pretty standard issue summer rain: heat and humidity induced downpours, mostly along the coast. There’s a boundary lying above us that’s finally moving off to the east. I think it will be gone entirely by tomorrow, since we have real summer heat moving in, right on schedule. Those rains are important to the crops, and in Mississippi, they were important for coaxing the corn and watermelons to be ready for harvest by the 4th! How beautiful this flower is, Linda, and nicely photographed. That basket is something pretty special. One of the reasons I like the basketflower is that it’s especially frilly when fresh — and so frowzy when it starts to go “over the hill.” I just found out that its genus is the same as the cornflower, or bachelor button — a garden flower that my grandmother favored. Perhaps that’s part of the reason I enjoy the basketflower as I do. I’ve always liked basket flowers too. They grow in prairie land too. That’s where I initially saw them in flower when I was growing up. The photos are quite lovely. Lucky you, to grow up with these. I’ve seen them in Kerrville, Palacios, Galveston Island, and around El Campo. Now you’ve added sightings from what I think must be blackland prairie — what a flower! That is a most beautiful basket! Isn’t it, though? This is one of those flowers that leaves me more than a little puzzled, wondering why it evolved as it did. I’ve never paid much attention to that fancy basket, post-bloom. The flowers are fading now, so I’ll have a chance to keep an eye on them this year. Centaurea americanus reminds me very much of another favorite flower Centaurea cyanus, AKA the bachelor button, or blue cornflower, its European cousin. Never ceases to amuse me why the European version was imported as a sought after garden flower, but its native American version is anathematized as a weed. Our version has more color variety. You’re right about the color variety. Two years ago, I found some white ones in Palacios. Unfortunately, my camera skills weren’t what they would be today, but I think I might have one or two photos that are sharp enough to post. What amazes me is that sunlight or shade seems to affect the color, too. In shade, they’re more lilac, and in bright sunlight, generally pinker. It’s interesting. My grandmother had bachelor buttons that were blue, pink, and white, but she bought seed, and no doubt wanted the cultivars that had been bred for variety. I can’t imagine anyone calling these weeds. It’s true that they aren’t exactly the neat-and-tidy sort, especially outside a garden, but that’s part of what I find so charming. Well, I guess this is one that doesn’t grow here because I can’t ever recall seeing it. 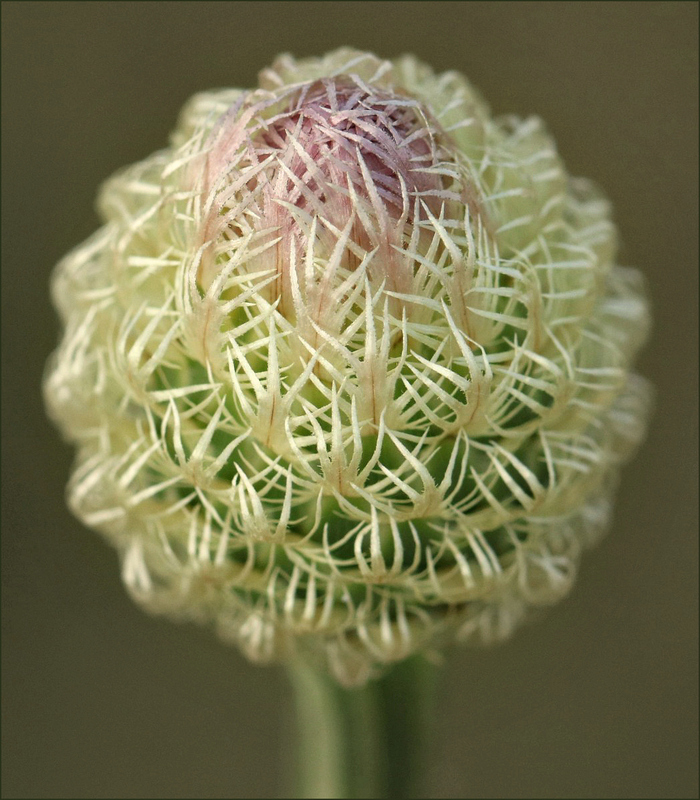 Love the woven basket appearance beneath its flower portion — thank you for that nice closeup! I checked, and it does make sense that you haven’t seen it. In all of Illinois and Indiana, there are exactly two counties where the USDA shows it on their map: Lawrence and Wabash, in Illinois. We share a good bit, flower-wise, but there are some differences. I’m glad you liked this different little beauty. Thanks for checking, Linda. No wonder this one was “foreign” to my eyes! Isn’t it great that we each have special treats to share with others? Happy Independence Day — enjoy your celebrations. Isn’t that the truth! A few hundred miles this direction or that, and before long we’re seeing completely different flowers and grasses. That’s one reason I enjoy nature blogs from other parts of the world. It’s fun to see things I’ll never see here. By the way — Happy Canada Day! The 150th is special! Your photographs haved done that for me. Thanks for the birthday wishes, and I hope you had a good July 4th celebration on your side. I did — although I wore myself out a bit by spending all day out in the heat. But it was a fine time, and now I have some new photos to share! Nature’s intricate designs – her artists and skill – never fail to astound me. Beautiful catch! I remember those hats. As a matter of fact, I see Delva and her signature hat on a regular basis, and I always smile at the way she’s turned it into a mark of her brand. Say “fancy hat” to anyone who’s been in the area for a while, and almost always they associate it with her. Now the question is, every time I see a basket flower, will I think, “Delva!”? Bless your dad, though. There’s no annoyance like trying to see around one of those things. Who knew that such beauty could be found at an old power generating station? A couple of months ago, I found another thistle that was new to me, and it was a beauty, too. 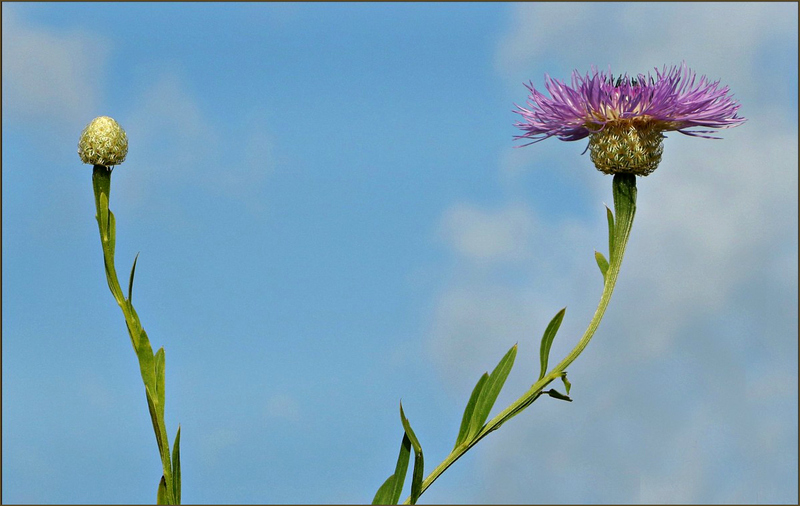 Unfortunately, musk thistle is an invasive, and listed as a noxious weed in some states. It doesn’t seem to have made such inroads in your area, but you might want to consider discouraging it if it shows up. It’s fairly easy to distinguish it from other thistles. The basketflower bloom is as pretty and interesting as the basket. You’ll see! Fantastic, Linda! I’m only passingly familiar with Centaurea and I’ve never investigated the bud – wow! I love that image. And I can really see the basket in that last one – sweet! Once the flower has finished blooming and the seeds are forming, the basket really comes into its own. I need to do my seed collecting and photographing of the fading flowers pronto, before another mowing crew shows up and thinks, “Oh, ugly” — and dispatches them. I just saw some of your species last night, in this wonderful video about preserving native habitat in English church yards. Despite some differences in approach (and species, of course) it’s interesting to see the commonalities between what’s shown, and our prairie management. I was especially taken with the yellow rattle. I wondered if it might be related to what we call rattlesnake master. Her description of the rattling seeds certainly was familiar. I’m glad you like this one, too. It’s a cousin of one you surely know: the cornflower. Although I have no large swaths of basket flowers to photograph, or very many other species for that matter, we have experienced a period of fear for blooms that have been dispelled as they catch up to the time. Lots of late bloomers here this year. Nice studies of the intricacies they offer. We’ve had early bloomers this year, and late bloomers, and a good number that seem to have decided to give it one more go, like Indian paintbrush. Their big spring bloom came and went, but now they’re back, in numbers sufficient to lead to puzzlement. It may be that an extended, slightly cooler spring and nice rains are responsible. The basket-flowers certainly are profuse. I’m never sure whether a species is having an especially good year, or I just haven’t noticed them before. I suspect sometimes it’s both.